Embarkation Barcelona: The quickest easiest I have ever had. They grab your luggage as you exit the taxi and don&apos;t have to haul it through any lines. Had a Jr suite so had priority check in and nobody was in line so we went straight through but even the regular line looked very reasonable. We were on the ship in 30 minutes! Contrast that to Navigator in January 15 in Galveston were we waited for over two hours in various lines. Food: This was probably the lowlight of the trip. We all felt in our party that the main dining rooms was just OK. We did like My Time Dining as having excursions allows you to be flexible but we only ate main dining three times the whole week. The wait staff was mediocre. We had better staff the one day we changed our reservation time. The tables are so close together you can reach out and touch your neighbor and staff are trying to edge between chairs to serve. We actually found the Windjammer dinner to be a better selection and more our speed. We did eat at Izumi one night and it was fantastic. Also tried Vintages. Its a nice low cost option but was pretty mediocre. Johnny Rockets was OK. Hot Dog bar was kind of fun as was Doughnut place. We had most of our breakfasts at the much quieter Solarium. The fare was exactly the same every day and not quite as good as Windjammer but its quiet and you can easily find a seat. We also tried the Wipeout for b&apos;fast and it was not very good. Omelets were way overcooked. The Windjammer is the one place that gets very packed. We tried several times to go but line was out the door so we opted out. The one time we did go for lunch was pretty good. Ship: Overall you would not imagine that there are 6,000 plus people on the ship. They hide them very well with exception of the Windjammer. There are so many neighborhoods to explore depending on what you are looking for. Central Park was a huge hit! Boardwalk area was really nice as well. Definitely lots of places to escape. The one beef we had was several times the majority of hot tubs were shut down for "maintenance" . This happened more than they seemed to be open. Having only three hot tubs open at a time for a ship this big doesn&apos;t work. Since our itinerary was very port intensive we probably didn&apos;t have as much time to explore as we would have liked. Entertainment: Mama Mia was excellent ! True to real broadway production and not cheesy. We also saw the Oceanaria diving show which was pretty neat as well as the other show later in the week , Blue Planetwhich was just OK. Overall it was all pretty solid. Also enjoyed several of the bands and soloists that played in Central park from time to time. Service: Never really had any issues with the service on this cruise. Overall the staff was friendly and kind. Our room attendant was nice but honestly looked a little worn out. The only real rude people we found on the ship were some of the cruisers that would but in line, push you out of the way, take your elevator, and some that were just rude to staff. I always thought that Americans got a bad rap but these rude folks were all European. I think some of them could use some better manners. Wifi: Love the wifi and it always worked and was fast so we were able to keeping touch back home with the kids. We bought the two device package for the week and used our Gold 10% discount and I think it was like $140 and was well spent. Drink Package: We just bought the Ultimate (no alcohol) and we determined that it was not worth it as bottled water was not as readily available nor were the good coffee stations where you could get a latte. They should have more coffee machines for the good coffees. The one main on in the promenade actually made pretty good drinks. They could also use more Soda machines. The only ones we found were in Windjammer (closed at times), Wipeout (closed at times) and the Pizza place which was usually open. Ports of Call: Barcelona rocks! Lots to do and see. Go a day early or stay a day late as we did and are so glad that we did. We stayed at the Pullman Barcelona near the beach on the way in and Hotel 1898 on Las Ramblas on the way back and both were excellent. Marseille was difficult. Not much to see from where you dock and you have to take a paid bus ride if you want to go into town. We had a private car arranged to take us to Aix En Provence (really not much to see there) and Cassis. We wish we would have just gone to Cassis and spent the day there. One of the best meals we had was at a cafe there. La Spezia is not the nicest place. I think I would prefer Livorno. 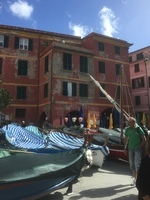 We had booked Cinque Terre but boats were not running that day so we had to take trains and that was a veritable nightmare! I would not suggest that during tourist season! We were glad that we had a guide to ourselves and were not in a large group as that would have been worse. Cinque Terre was amazing but we only had time for 3 of 5 villages as we were afraid we would get stuck on the train and not be able to get back. Would lover to spend more leisure time there. Rome, the port again is a ways out from actual Rome but was not too much of an issue. We arranged Rome in Limo for our tour with 8 people and it was fantastic although everything was still very crowded. I&apos;ll review full excursions separately. Palma De Mallorca was a favorite for all of us but I suggest taking the tour of Valdemossa and Soller and getting out of the main port. Naples was the top ranked port of call. The scenery is amazing and so many options for tours. 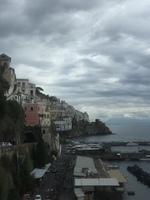 We hired Simply Amalfi for our tour of Pompeii and the Amalfi Coast and it was amazing with singing opera guide as well. We loved all our excursions and booked them all independently and I felt sorry for the masses following around the RC guides with their placards. Spa: Last day of cruising I hoofed it to the spa for a massage. The massage was great but I always hate the up sell on the extra stuff. Its always something different and always more expensive than the massage. I have bought some of the stuff they have recommended and some has actually worked but would appreciate just being told about the products and not having the masseuse always trying to push it. I also tried the Go Smile whitening treatment and I actually had pretty good success with the single treatment but as anything else they will try and up sell two more months of home treatment and I had not done enough research to tell if it was worth it. Disembarkation was also a breeze. They were actually running ahead of schedule. We chose the last time and they were running about thirty minutes early. It wasn&apos;t easy to hear the announcements. The only problem getting off so early was our car was arranged for an hour later so we had to sit and wait. Tips: Book a room on the side of the ship that will cruise the coastline so you can see more Book your own excursions. Just do some research here on CC and you will be rewarded Get the Wifi package as it was worth it Avoid the Windjammer at peak times Take taxis to/from the port of Barcelona as there is no need for private transportation and it will be cheaper. Go early to Barcelona and take the Montserrat tour Bring an Umbrella just in case of bad weather Bring a small power strip as there are minimal plugs in the cabins We had a wonderful time overall so much so that my Dad who traveled with us with my step mom is already booked on the Allure again for the Caribbean in January! Embarkation Barcelona: The quickest easiest I have ever had. They grab your luggage as you exit the taxi and don&apos;t have to haul it through any lines. Had a Jr suite so had priority check in and nobody was in line so we went straight through but even the regular line looked very reasonable. We were on the ship in 30 minutes! Contrast that to Navigator in January 15 in Galveston were we waited for over two hours in various lines. Food: This was probably the lowlight of the trip. We all felt in our party that the main dining rooms was just OK. We did like My Time Dining as having excursions allows you to be flexible but we only ate main dining three times the whole week. The wait staff was mediocre. We had better staff the one day we changed our reservation time. The tables are so close together you can reach out and touch your neighbor and staff are trying to edge between chairs to serve. We actually found the Windjammer dinner to be a better selection and more our speed. We did eat at Izumi one night and it was fantastic. Also tried Vintages. Its a nice low cost option but was pretty mediocre. Johnny Rockets was OK. Hot Dog bar was kind of fun as was Doughnut place. We had most of our breakfasts at the much quieter Solarium. The fare was exactly the same every day and not quite as good as Windjammer but its quiet and you can easily find a seat. We also tried the Wipeout for b&apos;fast and it was not very good. Omelets were way overcooked. The Windjammer is the one place that gets very packed. We tried several times to go but line was out the door so we opted out. The one time we did go for lunch was pretty good. Ship: Overall you would not imagine that there are 6,000 plus people on the ship. They hide them very well with exception of the Windjammer. There are so many neighborhoods to explore depending on what you are looking for. Central Park was a huge hit! Boardwalk area was really nice as well. Definitely lots of places to escape. The one beef we had was several times the majority of hot tubs were shut down for "maintenance" . This happened more than they seemed to be open. Having only three hot tubs open at a time for a ship this big doesn&apos;t work. Since our itinerary was very port intensive we probably didn&apos;t have as much time to explore as we would have liked. Entertainment: Mama Mia was excellent ! True to real broadway production and not cheesy. We also saw the Oceanaria diving show which was pretty neat as well as the other show later in the week , Blue Planetwhich was just OK. Overall it was all pretty solid. Also enjoyed several of the bands and soloists that played in Central park from time to time. Service: Never really had any issues with the service on this cruise. Overall the staff was friendly and kind. Our room attendant was nice but honestly looked a little worn out. The only real rude people we found on the ship were some of the cruisers that would but in line, push you out of the way, take your elevator, and some that were just rude to staff. I always thought that Americans got a bad rap but these rude folks were all European. I think some of them could use some better manners. Wifi: Love the wifi and it always worked and was fast so we were able to keeping touch back home with the kids. We bought the two device package for the week and used our Gold 10% discount and I think it was like $140 and was well spent. Drink Package: We just bought the Ultimate (no alcohol) and we determined that it was not worth it as bottled water was not as readily available nor were the good coffee stations where you could get a latte. They should have more coffee machines for the good coffees. The one main on in the promenade actually made pretty good drinks. They could also use more Soda machines. The only ones we found were in Windjammer (closed at times), Wipeout (closed at times) and the Pizza place which was usually open. Ports of Call: Barcelona rocks! Lots to do and see. Go a day early or stay a day late as we did and are so glad that we did. 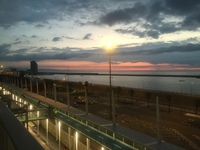 We stayed at the Pullman Barcelona near the beach on the way in and Hotel 1898 on Las Ramblas on the way back and both were excellent. Marseille was difficult. Not much to see from where you dock and you have to take a paid bus ride if you want to go into town. We had a private car arranged to take us to Aix En Provence (really not much to see there) and Cassis. We wish we would have just gone to Cassis and spent the day there. One of the best meals we had was at a cafe there. La Spezia is not the nicest place. I think I would prefer Livorno. We had booked Cinque Terre but boats were not running that day so we had to take trains and that was a veritable nightmare! I would not suggest that during tourist season! We were glad that we had a guide to ourselves and were not in a large group as that would have been worse. Cinque Terre was amazing but we only had time for 3 of 5 villages as we were afraid we would get stuck on the train and not be able to get back. Would lover to spend more leisure time there. Rome, the port again is a ways out from actual Rome but was not too much of an issue. We arranged Rome in Limo for our tour with 8 people and it was fantastic although everything was still very crowded. I&apos;ll review full excursions separately. Palma De Mallorca was a favorite for all of us but I suggest taking the tour of Valdemossa and Soller and getting out of the main port. Naples was the top ranked port of call. The scenery is amazing and so many options for tours. We hired Simply Amalfi for our tour of Pompeii and the Amalfi Coast and it was amazing with singing opera guide as well. We loved all our excursions and booked them all independently and I felt sorry for the masses following around the RC guides with their placards. Spa: Last day of cruising I hoofed it to the spa for a massage. The massage was great but I always hate the up sell on the extra stuff. Its always something different and always more expensive than the massage. I have bought some of the stuff they have recommended and some has actually worked but would appreciate just being told about the products and not having the masseuse always trying to push it. I also tried the Go Smile whitening treatment and I actually had pretty good success with the single treatment but as anything else they will try and up sell two more months of home treatment and I had not done enough research to tell if it was worth it. Disembarkation was also a breeze. They were actually running ahead of schedule. We chose the last time and they were running about thirty minutes early. It wasn&apos;t easy to hear the announcements. The only problem getting off so early was our car was arranged for an hour later so we had to sit and wait. Take taxis to/from the port of Barcelona as there is no need for private transportation and it will be cheaper. We had a wonderful time overall so much so that my Dad who traveled with us with my step mom is already booked on the Allure again for the Caribbean in January! Cabin: Deck 7 Junior suite was a splurge this time for our anniversary. These are great rooms. The best feature for us was the walk in closet so you could store all your stuff. The bathrooms are upgraded with a shower/tub rather than just shower. You also get a small sofa and chair. The balcony has a small table and chairs as well as two lounge chairs so is much wider than the Balcony rooms. I can&apos;t seeing needing anything larger as this was perfect size for us. If I could afford it would spring for it again. The place was very overcrowded. No regulation for how many people can enter at once making it very difficult to follow a tour of 31 people. Julia Travel should not book this many people with one guide. The guide was informative but the crowds detract from the splendor of the place and make maneuvering inside difficult. You should definitely visit La Sagrada as there is nothing like it in the world but hopefully visit at a less bust time. Excellent guide, smaller group of 15. Charter bus to the site shared with two other groups. Tour of grounds and Basilica with the guide. 1 hour free time can be spent at the museum, hiking or taking the funicular to top of mountain. We hiked and it was beautiful. The museum has some interesting things as well. I would go back to hear the choir (they don&apos;t sing on Saturdays) as well as to explore more. Guide was adaptable as it was so busy it was hard for tour buses to get in parking lot so at their expense they let us take the train down which was really nice. Lunch at Soller de Mas was really nice to sit a long table and get to know the various guest on the tour. Tour of the winery which is in a 1000 year old castle was interesting and the wine was actually pretty good. Long day but great trip. Port of La Spezia is not the nicest and the weather was dreary the day we were there. he boats were not running to Cinque Terre so we were forced to take the trains which was a nightmare. Our guide was an older lady who didn&apos;t seem too thrilled that we still wanted to visit in the dreary weather but we didn&apos;t want to miss out. There were still way too many tourists in late September. Trains were standing room only every time. We only visited three of the towns as we were afraid that we would not make it back to the ship in time. Our guide was not overly enthusiastic about anything that day. We did enjoy seeing the villages and enjoyed the best meal of the trip at Monterossa. They the fresh anchovies in lemon oil (not salty at all). Local pesto and pasta as well as mussels in wine and garlic all fantastic. Cute villages perched on the seaside. No cars allowed but lots of people! Booked a driver to take us to Aix. We were basically dropped off at the main street and allowed an hour there. They had a soothing street market going on but other than that we had no idea what to see or look for so just walked the main street and had a coffee at a cafe. There really wasn&apos;t much to see. 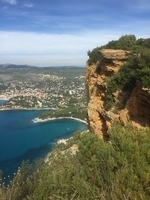 After Aix visit driver took us to an overlook for a really nice view of Cassis and then into the town. Loved this seaside town and would have preferred to have just spent the day there. Ate a fresh John Dory fish and mussels all cooked perfectly. Our favorite place of the trip as well as our favorite guide Salvatore who will sing opera for you while he drives and he&apos;s actually good! Such a friendly guide with lots of history and passion for what he does. The drive along the Amalfi coast is amazing. I would hate to be in a tour bus to do it though and we were so happy we were in a van and had flexibility to stop to take photos. We went to a mountain restaurant in the village of Ravelo. Beautiful scenery again and pretty good food too. Then we were off to Pompeii for a self tour for two hours. 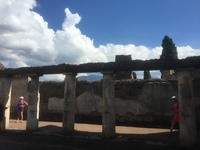 We should have booked a guide for this portion because Pompeii is huge and the maps are not very helpful. Salvatore was kind enough to take my parents back to the ship. My step mom was having health issues so he took them back and left us at Pompeii and came back to get us. I really appreciated his flexibility. I can&apos;t wait to go back to spend more time in Amalfi and look up Salvatore and have a drink or something! Great tour of Palma, There were about 15 people on a minibus. The one big problem we had was finding the meeting point. The directions said we could walk there when in fact we figured out that we had to take a taxi that cost an additional 11 euro and we know we were ripped off as it was only a few miles. They need to change the directions or meet at the ship. They were able to drop us at the ship. The guide was very knowledgable. Enjoyed the ride through the almond and olive orchards to Valdemosa. Cute old little town with nice little cafes for tasting the local pastry/bun. Lots of history. We then traveled along the mountainside to Soller. Very cute and quiet seaside town lots of cafes. My parents wanted to come back to Soller for vacation. Rome has a lot to see and you only have a day but I thought we accomplished quite a bit. 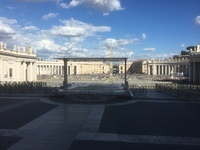 You do need to pre-purchase your coliseum tickets as well as Vatican tickets. Our guide Rolando was fabulous. Retired gentleman doing it for the love of it. We had a shared tour with 8 people. Visited Coliseum, Spanish Steps, Trevi Fountain (under construction), and the Vatican including the museum, sistine chapel and St Peters. The Vatican was packed with tourists. We hired a separate guide for this part and glad we did to help navigate the place. The line to see Sistine was incredibly long and winded though the various corridors. You only get a few minutes to try and absorb what you are seeing which is a shame. I much more enjoyed St Peters Basilica because it was not as crowded and there were some interesting things in there as well as the Pieta. Rolando took us to a local friends place for pizza, pasta, wine, Grappa etc.. for a very reasonable price. The food was not spectacular but the ambiance was wonderful as were the restaurant owners. Overall a wonderful day. Would perhaps need to go back to stay in Rome to go back and spend time at some of the other sites.